It is amazing to me that whoever calls and whatever time it is, there is always room for compassion, even at 3:00 a.m. Sometimes the callers at this hour are lonely and cannot sleep, other times the caller is in emotional distress. We have a diverse background for our Crisis Listener team. Many of my coworkers have past experience with working in the mental health field, serving as an encyclopedia of knowledge and resources. One of them in particular, who has a calm spirit and years of experience, ended up talking to me about an active suicide I took. He was able to assess the call with me and gave me hope that the caller was talking about the future, so there is a chance the caller did not end his life as I had feared. I personally come from the School Counseling realm and my knowledge of the educational world has helped me suggest to callers resources that are available at schools. After my first scary call, I was not sure I was cut out for the Helpline. I have learned to gain confidence as I have taken more calls. Our training at ACTS helped prepare me for the serious callers. After a year here, I am confident I can de-escalate callers. When a caller refuses to problem-solve or de-escalate and is at high risk, we will sometimes have to initiate active rescuse. If a caller is needing to talk longer, we tend to offer a follow-up call. After my first year, I have reflected on our frequent callers. It is amazing to see the progression and it is inspiring to know we have helped facilitate that change. Building rapport with a caller can be tricky at times, but once a wall is down and the caller feels understood, it is amazing what healing can take place. Through this unique position we work with hospitals, counselors, parents, and law enforcement. It is gratifying to be able to collaborate with other community workers. As my experience has grown with the active suicide callers, the 911 operators have taught me more questions to ask the callers before contacting them. Some operators will hang up once they have the information they need, others want us to stay on the line until help has arrived. I remember one caller wanting to jump off a bridge. I convinced him to sit on one of the benches and wait for help to arrive. At one point we had phone issues and the caller was no longer responsive. The 911 operator was able to assure me that there were cameras on the bridge and she had visual of the caller. Eventually, the caller was able to communicate with me again. The information from the 911 operator helped keep me calm in the crisis. At times it is difficult to talk logically to a suicidal caller that is overwhelmed to the point they are in an illogical state of mind. Finding what the caller values and reminding them of that can help to keep them grounded. We often get calls from loved ones who are worried about someone having suicidal thoughts. They worry about calling the police because they do not want to upset their loved ones. I find it can help to be empathetic to their feelings, but then remind them to err on the side of caution because the risk is too great. Just when I think I have heard it all, another call will surprise me with something new. Answering the phone, it is unpredictable what crisis is on the other end of the line. There is seldom a dull moment in this work and I am constantly learning. The holidays can be a busy time for our hotline along with political events and natural disasters. In any occasion, we remain neutral and help the caller talk out their feelings. We give referrals out to multiple mental health agencies and services. I have several tabs on my computer for the most frequent resources we give out. I had never heard of taxi and motel vouchers until working at the Helpline. Not every hospital participates, but there are some that can provide taxi vouchers for patients who cannot afford transportation home. Motel vouchers is another program that some police stations offer for callers who do not have a safe place to stay for the night. Many callers are unaware of the resources available to them such as: the National Alliance of Mental Illness (NAMI) for counseling referrals, walk-in clinics, or the option to request a Mental Health Evaluation. One young caller was relieved to know the hospital was a safe place he could go to get treatment for his suicidal ideation. Loved ones are surprised it is okay to call 911 for someone that is suicidal. Suicide is an emergency, so 911 should be used in those circumstances. Awareness is growing about the National Suicide Prevention Lifeline. Many of our callers are thankful our service is there for them to call in desperate times. It is important that we have a confidential place where callers can be anonymous and talk to someone 24 hours a day for support. Just knowing someone listens and cares can make all the difference. We get calls from all over the United States, Canada, Europe, and Asia. International callers from America that live in the United Kingdom have expressed that our hotline has been helpful for them to connect to someone who understands, as counseling is different overseas. Over time I have developed a “Spidey-sense” to navigate the calls to keep within the time limits and maintain the caller’s focus on their primary issue. Being a Crisis Listener is unique as we work with all ages and all issues. Sometimes the callers can be a reflection of struggles I have faced in the past and wish someone could have been there for me. 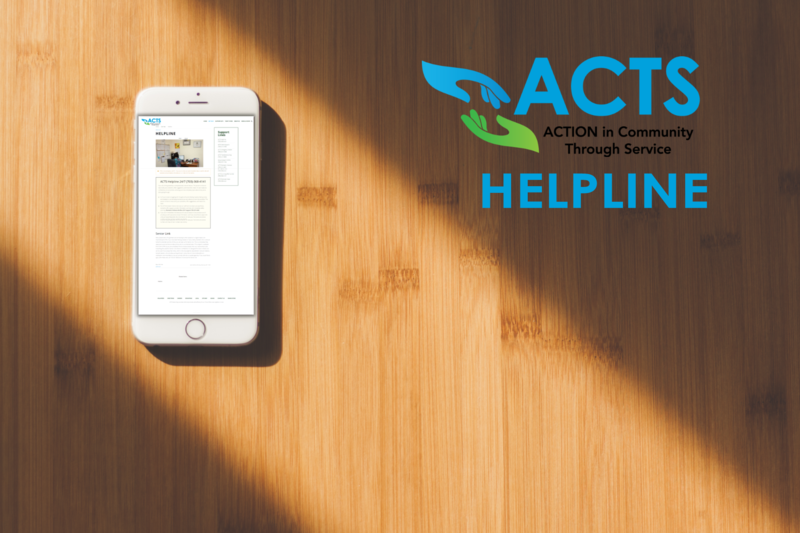 Working at the ACTS Helpline continues to be a rewarding experience. I am learning to stretch and grow in this role. We have an amazing department. Our Director for Suicide Services and Helpline, Will Harms, has the perfect antidote for any concerns I have. He is also amazing at training, specifically roleplaying as the callers in scenarios. Will is great at Improvisation as each role-play with my training group felt like a real call. Vicki Graham is the Chief Program Officer for Crisis and Trauma Services. The training I did with her has also been invaluable. Whenever I have an active suicide and start to doubt I can get help to them, I remember to not give up and keep the caller talking to figure out where they are. It feels like a needle in a haystack, especially with the sparse information some callers provide. It is with perseverance and keeping a keen ear to everything the caller says that usually the caller will give me enough information to get them help. I have had a dream to work at ACTS for a long time. The more I learn about ACTS, the prouder I am of where we all have the privilege to work. Dreams do come true.